For certain, $15M/year in AAV (average annual value) seems like a lot for a guy who has never driven in more than 65 in a season or scored more than 55 runs in a year. Actually, his career high in home runs for a season is 14 (2011), and that represents the first time he’s crossed into double digits in HR. Just for a moment consider the mileage that Molina has on his body already. Over the last 3 seasons, Molina has caught in 410 games. For his career, he has already played in 928 games since age 21, and he’s been the everyday guy for the bulk of that time. Consider that Molina’s odometer already has 7668 2/3 regular season innings on it, and he’s just getting ready to start his age 29 season. For the sake of comparison, Mike Piazza played in 981 games in his first 8 seasons, and he had a slightly later start than Molina did. Piazza was still a productive backstop for another 3+ seasons after his 8th one. Maybe Ivan Rodriguez serves as a better example, because he started in the big leagues at age 19. During his first 8 season, he played in 1025 games. He was more than just simply productive during seasons 9-16 (age 34). Pudge Rodriguez actually managed to produce 6.0, 4.9, 4.6, 3.0, 4.0, 4.8, 3.1, 3.9 WAR during those additional 8 seasons. Sure, Piazza and Pudge are both certainly freaks of nature and definitely hand-picked examples, but the point is that there is a precedent for catchers producing well into their 30’s. Besides, something unique differentiates Molina from Piazza and Pudge. Molina isn’t really expected to hit a lot or carry the team. The Cardinals have done quite well during the first 8 years by getting 14.1 WAR out of someone considered primarily a defensive catcher who can handle a pitching staff. Will the Cardinals get another 10-12 WAR out of Molina during the next 5-6 years? Nobody knows. That’s why it is so hard to determine whether or not a team has overpaid while the ink on the contract is still wet (or before it even gets there). My belief is that if you told the Cardinals that Molina would catch an average of 125 games a year for the duration of the contract while putting up 2.0 WAR per season, they would take that deal. Why? As long as Molina keeps doing what he almost always does, the Cardinals and the surrounding media can keep touting him as the best catcher in the game. That sort of marketing may deserve a blog all its own, but let’s just say that perception and reality can easily diverge without anybody on either side complaining. Is Yadi clutch? Well, there certainly is a perception that he is, and that really matters more in many ways than the reality. Consider Yadi’s “clutch” numbers for the past 7 full seasons. 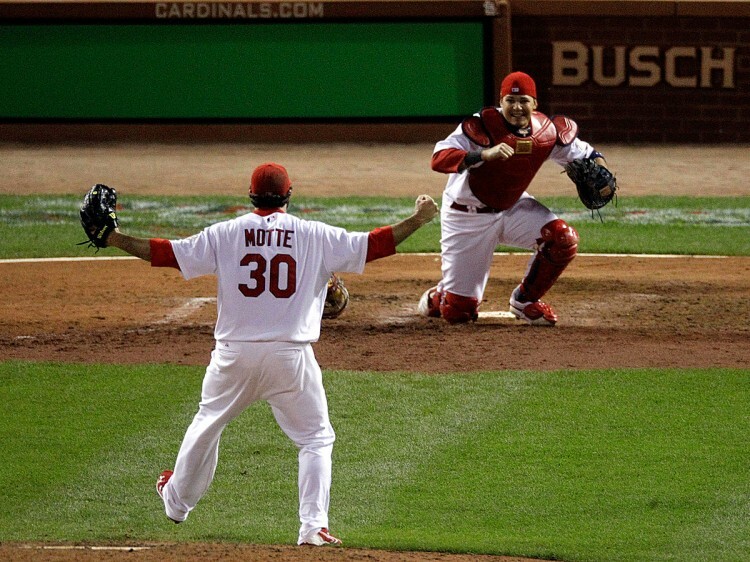 Yadi definitely has a history of being clutch at times, and maybe that really is all that matters. Perhaps Yadi just has a thing for coming through when people notice it the most. There are certainly worse traits to have. On the other hand, just consider Molina’s playoff numbers. That is when the man with a career regular season line of .274/.331/.377/.707 steps up his game to the tune of .309/.354/.417/.772. That playoff line comes from 189 plate appearances in 50 games spread over 5 different years. If he isn’t clutch, then he’s the closest thing there is. Maybe the Cardinals are overpaying, but the free agent market isn’t exactly going to be overflowing with 4-time winners of the Gold Glove at catcher. If you truly believe that defense wins championships, then Molina deserves a lot more credit than he gets for the success the Cardinals have had over the last several years. He may only be a 14.1 WAR player thus far, but 8.0 of that comes from dWAR. That’s good enough for 115th on the career list and 14th on the active list. Worth $15M a year? I think so. Yadi is SO money, and maybe now he knows it. TIDBIT: While I may not like the idea of signing a catcher well into his mid-30’s, there is one thing the St. Louis “homer” in me likes about this extension. There is no sight in baseball quite like that of Yadi whipping off his mask and running/jumping in the direction of a pitcher to celebrate a win. Air Yadios, indeed! Follow gr33nazn on Twitter for more butchered quotes from the movie “Swingers”! I’ll buy into your line of reasoning. At the very least, I think this is a contract that needs to be evaluated on the backend of the deal, not the frontend, which you’ve somewhat alluded to. That is to say, there’s no just criticism until he either lives up to expectations (which have been pretty fairly outlined in your article) or fails to do so. It’s a very interesting contract with respect to implications of other catchers who will be facing similar situations a few years down the road, as well as for the Cardinals specifically. Thanks, David. I actually started writing this while trying to convince myself that I should buy into this contract. This is definitely an example of when I wonder how much differently the team values a particular player than the way outsiders do. In that sense, maybe the Cardinals are also factoring in continuity, tradition, and a potential face of the franchise attitude. I do usually take the wait-and-see approach to contract evaluation, but I do think that this is probably a decent bet. To take your thoughts a step further, can you really put a pricetag on continuity behind the plate when you have a highly touted group of young arms that look to be making their MLB debuts (and ideally, cementing spots in the rotation) during this contract? I think it’d be worth a few extra million dollars to secure a reliable defensive catcher to put the icing on the developmental cake for ace potential starters currently in the farm system, not only for the Cardinals specifically but for teams in general. I think the Cardinals have a bunch of dudes in their front office that know way more about the value of catcher defense and game-calling than I do. And it can’t hurt to have a former catcher manager advocating for you, right? I do have faith in the front office, but let’s always keep in mind that we’re still in the “Kyle Lohse Era”. 4 yrs / $41M? I do agree with David’s point about the up-and-coming group of pitchers. Knowing that a Gold Glove catcher is behind the plate doesn’t usually hurt matters, and it does allow them to throw 59′ breaking balls on occasion. Kyle Lohse contract would look a lot different in hindsight without the freak injury, IMO. Indeed, but I never did like the idea of giving a contract like that to a guy with a career 4.67 ERA and 1.413 WHIP. Money like that should be reserved for the likes of Jeff Suppan (ok, I’ll stop). See, at least they passed on Soup and Pineiro. Saw something they LIKED in Lohse (I guess). Previous post: UCB Roundtable: Who is the keeper of “The Cardinal Way”?